You are currently browsing the category archive for the ‘chicken and egg’ category. One of the great things about living in a small farming town is that I really do get to know the people who produce food locally. Vangie Alexander runs Tranquility Heights Farm, a small-scale poultry and dairy just outside Palmer. She sells eggs in area specialty stores, provides raw milk to those with shares in her condo cow, and works in a local doctor’s office (the same office where we take our kids in fact). And after talking to her about her operation I knew to search out Red Star hens for our backyard coop — they are impressive layers. (I shot this video as part of a project for the Alaska Farmland Trust, with funding support from the State of Alaska Division of Agriculture). We’re getting 12-18 eggs a week from our hens right now, and even with a house full of summer visitors it’s easy for us to get behind. So when the cartons start filling up, we think quiche. It’s simple, popular with our kids (it is a pie after all), and generally provides leftovers for a few days. I used home-grown beet greens in my latest effort, instead of spinach, which gave the filling a little more body. Cook the bacon, reserve a small amount of grease and use it to saute the onion. Steam the beet greens. Set onion, greens and bacon aside. Beat the eggs and fold in the rest of the ingredients, followed by the onion, greens and bacon (crumbling the bacon as you add it). Saving some of the cheese as a topping. Pour the mixture into the pie shell and bake at 350-degrees for about 30 minutes or until firm. The second in a series of cooking the whole chicken recipes. Heat a heavy skillet over medium-high heat. Preheat oven to 350 degrees. Dry chicken and sprinkle both sides with breadcrumbs, salt and pepper. When skillet is hot, swirl in 1 tbls vegetable oil. Brown chicken for 2 minutes per side, then place on a rack into oven. Whisk together stock and flour. Add butter, stock mixture, and lemon juice to skillet and reduce by half. Remove chicken from oven when meat is firm and juices run clear when cut, 8-10 minutes. Stir parsley or dill into sauce, pour over chicken, and serve with buttered egg noodles. Feeds 2. Our rooster was the guest of honor at our small Super Bowl party last weekend. Good for us, not so good for him. South Central Alaska started 2009 with a brutal cold stretch — nearly two weeks -35F to -15F — and our four chickens were literally cooped up. The low temperatures didn’t bother them all that much but they didn’t want to go outside and the close quarters became a problem: the chill didn’t cool the rooster’s desire and the leghorns, at half his size, were too small for his attentions. As the inside of our coop began to look more and more like something off the set of “The Shining” it became clear we would have to free up some space. And since the plan from the beginning was to house three hens only it was time, finally, for the odd man out to go. While concerned about egg production after the rooster’s disappearance, and our brahma hen did stop laying for about three weeks, we were more worried that one of the leghorns wouldn’t survive the winter. So we packed the aptly named Lovey-Dovey off for processing at Triple D Farm and Hatchery. (Anthony, the owner, when we picked up the vac-packed carcass: “That’s a nice chicken”. He wasn’t talking about his personality). Since there was a crowd to feed on Sunday we opted to roast the entire bird using Marcella’s recipe (as posted earlier by Audrey). The meat was tougher and darker than what I would expect from a store-bought bird, but also had a richer, more flavorful taste. The hint of lemon was a nice addition as well. We were curious how our two girls would react to seeing our front-yard rooster on the table. Since we’re trying to keep the chickens as an exercise in eating local, not as a more exotic form of pet, we’ve been up front with the girls about where the birds are going to end up and so far they’re taking it in stride. Though they do keep referring to the meat as turkey. After a bit of a hiatus from blog life and cooking in general, I’m back. And what better way to ease back into the swing of local eating than with a whole chicken from Stokesberry Farm in Olympia, where the animals rotate pastures with cows. My first thought was to roast the bird according to Marcella Hazan’s amazingly simple and foolproof method. Her chicken comes out a gorgeous golden brown, with the crispiest skin and most succulent meat, and it goes with whatever else you feel like eating. It’s really the perfect winter food. Quick figuring suggested this could make four dinners for two people at the very least, with back and bones put towards stock and remnants boiled down for the dogs. Everything would be used well. (There wasn’t a head, neck, giblets, or feet.) Suddenly the math wasn’t looking so terrible on a $19 chicken, and one that came completely local, organic, and pastured to boot. One issue was convincing a reluctant husband to eat all the various parts. He’s a big fan of what’s known around here as White Guy Meat, which is to say boneless, skinless, chicken breast, though he isn’t completely hopeless — he did try chicken feet once, back when he was still trying to impress my dad. Still. I was well advised to start with something that would taste good to him, and I opted for a lemony chicken piccata from a halved breast, buttered noodles and a salad. It tasted pretty darn good to me, too; I’ll post that recipe in a day or so. And stay tuned. As we speak, thighs and wings are soaking in buttermilk for homemade fried chicken. Preheat oven to 350 degrees. Rinse entire chicken under cold water then air dry on a rack, about 10 minutes. When skin is dry, rub salt and pepper generously into the skin. Puncture lemon with the tines of a fork, place in the cavity, and tie drumsticks together across the cavity with kitchen string. Place chicken on a rack, breast side down, and roast at 350 for about 30 minutes then flip chicken so breasts are up. After 30 minutes more, increase heat to 400 degrees. Chicken is done when juices run clear, 20-25 minutes per pound. Remove lemon before serving. Feeds 6-8 generously. *Check out fellow blogger Katrina’s post on the Kyocera knife for thoughts on good chopping. The low temperature in our chicken coop so far this winter is 7 degrees (that’s –14C) and the current temp is 25. The birds don’t seem to mind, though, which is exactly what our (Alaskan) chicken farming friends told us as we started this get-to-know-your-food adventure. Stephanie and I picked up our four chickens in July, the height of the Alaskan summer, and as the days grew shorter – and colder – we became increasingly worried about our layers (the rooster? Not so much. His purpose in life seems to be eating and hassling the ladies). Not because they appeared to be in distress but because we felt like they should be in distress. We heard horror stories about frozen off chicken feet (apparently the bird survived just fine without them) and suffocation due to the build up of ammonia fumes (if the coop doesn’t have enough ventilation) but for the most part our friends told us not to worry. We used a 2×4, instead of a rod, for a perch which allows the birds to keep their feet flat and tucked under their feathers. Our coop is fairly well insulated. With the heat lamp off the coop stays about 10 degrees warmer than the outside ambient temperature. We use a heat lamp for warmth and to stimulate egg production. 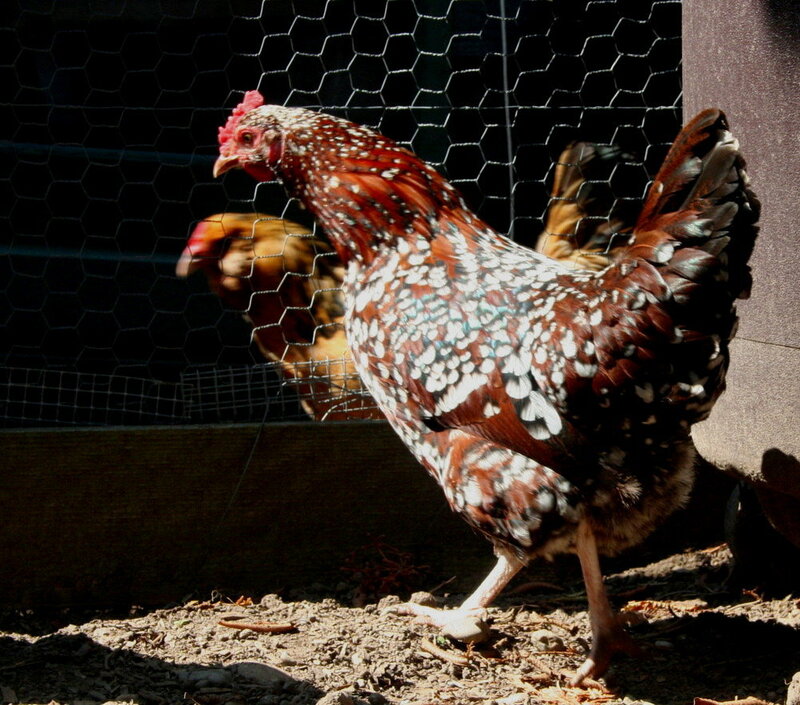 In order to keep the hens producing eggs they need to have at least 16 hours of light bright enough to read a newspaper by (according to the University of Alaska Fairbanks Cooperative Extension). Someone cleans the coop about once a week (full disclosure: it’s usually Stephanie). While not exactly a fun chore, the nuggets are frozen and the process of throwing the dirty bedding into the compost pile and putting out new straw takes less than 10 minutes. If egg production is any indication, our little flock is pretty happy. So far this December our three hens have laid 22 eggs. We imagine grumbling if they could talk, but they huddle together on their roost pretty well, and perhaps, like us, they get used to the cold weather. I know after a few days of minus 10, zero degrees feels positively balmy. Gray days and chilly nights have brought big changes to the henhouse. Since my last visit in September, the girls have shed their feathers and put on winter coats, and they were looking so very handsome and plump when I stopped by last week. Egg production has come to a near-standstill, a result of shorter day length, but my friend has no plans to turn the lights on to keep them laying. I’m curious to see what happens when freezing temperatures finally demand a heat lamp. Anyway, this wasn’t just a social call. 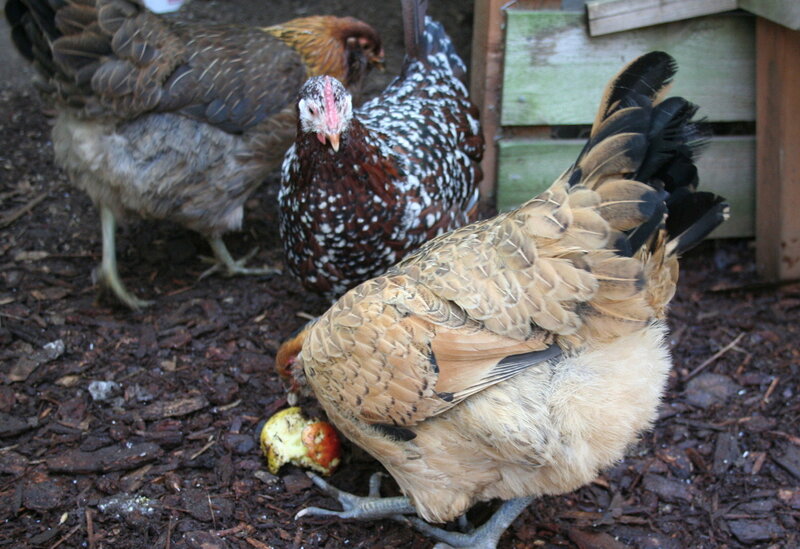 I was there to trade the last of my wormy apples, which the girls love snacking on, for something more useful to me: a big box of chicken poop and bedding, which I took home and mixed with lots of dry leaves as recommended by Seattle Tilth. If I can get the pile to heat up adequately, the resulting compost should be good to go for spring plantings. That’s how I’d describe this straw-bale construction chicken coop going up on Bronco Billy’s organic farm in central Oregon. And I read every word of his harrowing report on chicken predation too. Last week I cured salmon cold, and one thing led to another. This egg salad is a briny one, and entirely delicious. Mix chopped eggs, salmon, capers, shallot, mayo or yogurt, tarragon, and paprika and season to taste with salt and pepper. 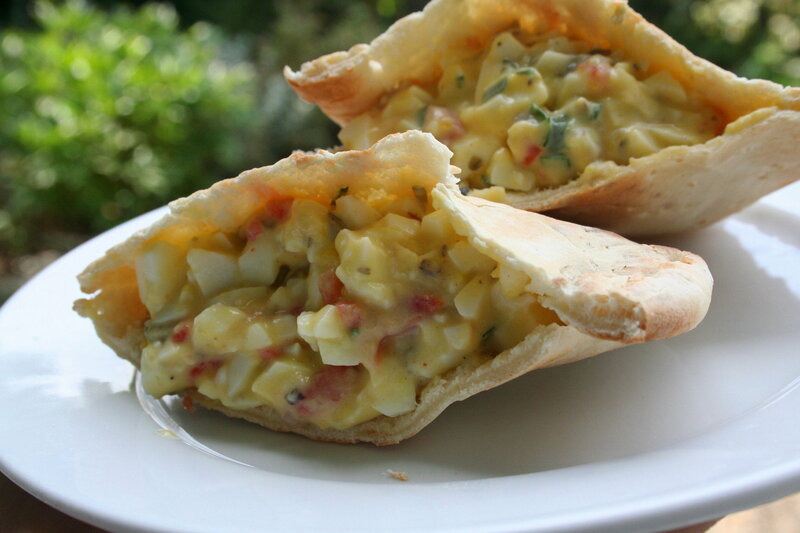 Stuff into a pita pocket, adding arugula leaves if you have some on hand. Yesterday I stopped in to visit the girls, who are coming up on a year old. I hadn’t been by in a while and it was good to see that they’re thriving. They’ve reached full size, two golden Amerucanas and a spotted banty named Tallulah who knows she’s a looker. The hens are getting better about using their nesting boxes, thanks to a helpful dummy egg — not too long ago they were laying all over the yard. I brought them a box of tart, wormy apples from our tree and my friend tossed a couple into the coop. The girls scurried right up and soon Cotton, the leader, was hacking away at the fruit. 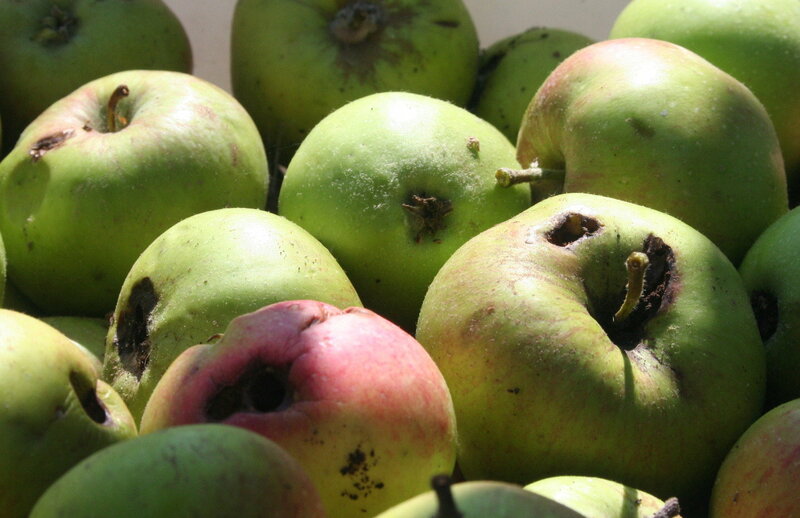 I think they’ll enjoy the grubs in the “bad” apples, too.